Doctors recognize that slipping rib syndrome is often unrecognized at the time of patient diagnosis and therefore an overlooked cause of chronic pain in the abdominal and/or chest pain area. Doctors also recognize that misdiagnosis or simply missing slipping rib syndrome as the cause of pain, the misdiagnosis may lead to excessive imaging, laboratory, and other complicated workups. 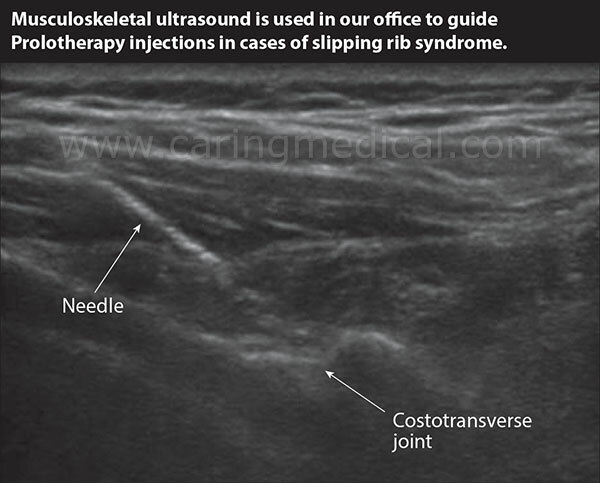 Slipping rib syndrome, which is also diagnosed as Tietze’s Syndrome, rib subluxation, costal margin syndrome, painful rib syndrome, costochondritis, clicking rib, displaced ribs, painful rib syndrome, traumatic intercostal neuritis, clicking rib, or rib tip syndrome, occurs when one of the ribs intermittently slips out of place, causing a stretching of the ligaments that support the front and back of the rib. 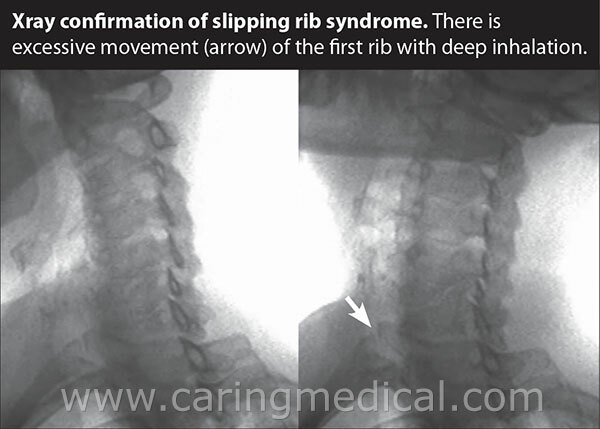 Slipping rib syndrome can occur where the rib attaches to the thoracic spine (thoraco-rib instability) or anteriorly at the rib-cartilage margin (chondro-rib instability) or sternum-rib margin (sterno-rib instability). When it is the latter, that is when it is called costochondritis or Tietze Syndrome. It commonly occurs in one of the upper ribs, because ribs one, two, and three take the bulk of the force when a person is bent over reading or doing computer work. When this condition affects the upper ribs, base of neck pain is common and can be severe, even causing pain down the arm into the hands and fingers, especially the index and little fingers. The eighth, ninth, and tenth are also common culprits because unlike ribs one through seven, which attach to the sternum, the eighth, ninth, and tenth ribs are attached anteriorly to each other by loose, fibrous tissue. Although this arrangement provides increased mobility of the lower rib cage, it also results in a greater susceptibility to trauma in this area. When the condition affects the lower ribs, such as the eighth, ninth, tenth, chest and upper abdominal ribs, pain occurs from the recurring subluxation (dislocation) of the costal margins of the eighth, ninth and tenth ribs due to hypermobility of their anterior edges. This allows a rib to slip behind the rib above it. Clinically, patients often note sharp, intermittent, stabbing pain followed by a dull achy sensation for hours or days. “Slipping:” and “popping” sensations are common, and activities such as bending, coughing, deep breathing, lifting, reaching, rising from a chair, stretching, and turning in bed often exacerbate symptoms. The cartilaginous ends of these ribs come in close contact to the terminal branches of the intercostal nerves. These nerves are particularly vulnerable to even trivial trauma. The pain can be both excruciating and spontaneous, and it can even simulate a heart attack. Pain from a slipping rib can travel along the intercostal nerve root and go from the chest to the thoracic area or vice versa. It can also be felt in the abdomen, shoulder or neck. It may also be precipitated by lying or turning over in bed, sitting in a car seat or armchair, bending forward, breathing deeply, coughing, vomiting, walking, abducting the arm on the affected side, eating, rotating the torso, bending the trunk, or riding in a bouncing automobile. Much of the research surrounds the pediatric and young athlete treatment of slipping rib syndrome as this uncommon disorder is more common in those two groups. However, adults can also acquire slipping rib syndrome with a forcible activity to the rib area including simple coughing to chest surgery for an unrelated cause. Rib joint instabilities can occur any time there is a violent force on the chest cavity, such as during athletic contact or even a thoracotomy (chest surgery). Rib joint instabilities can also occur when less force occurs over a long period of time, such as when a person has a low-level cough (bronchitis) or poor posture while hunched over a cell phone. Rib hypermobility is caused by weakness of the rib- sternum (sternocostal), rib-cartilage (costochondral), and/ or rib-vertebral (costovertebral/costotransverse) ligaments, allowing the rib to be hypermobile, and it is thought to be the primary cause of slipping rib syndrome. When this occurs, the condition causes chest pain in addition to upper back pain. Without large muscles to hold the ribs in place, loose ligaments allow slipping of the rib, which causes further stretching of the ligament and results in severe pain. A simple coughing attack due to a cold may cause the development of slipping rib syndrome. Conditions such as bronchitis, emphysema, allergies and asthma cause additional stress to the sternocostal and costochondral junctions. Even sinusitis, with its associated nose blowing, can be the initial event that leads to chronic chest pain from slipping rib syndrome. One clue that the painful conditions are due to rib joint instability is when the pain is increased with deep breathing. 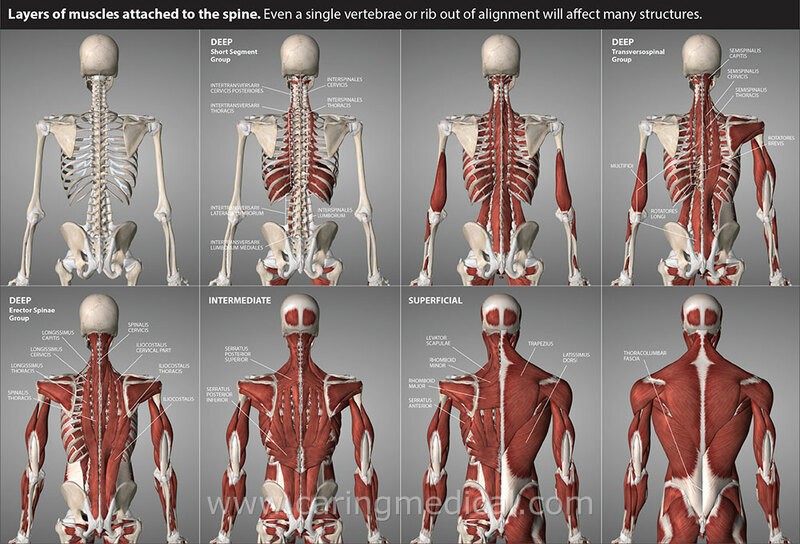 The thoracic cage moves up and down to allow breathing, so all the structures of the thoracic cage, including the thoracic-rib-sternal articulations, are never truly at rest. During inspiration, the upper ribs are elevated, which increases the anterior-posterior diameter of the thorax. The opposite occurs in expiration. When a healthy individual is at rest, the diaphragm and the intercostal muscles produce inspiration. The act of expiration is primarily passive. The action of the abdominals and the accessory muscles of the trunk and lower neck is usually minimal. However, when there are injuries or more serious oxygen demands, more of the respiratory muscles including the rectus abdominis is called into action as would occur during sporting activities, exercising or trauma. This puts a greater force on the rib attachments, and when instability is present symptoms increase. Non-surgical treatments may include recommendations for chiropractic manipulation, cortisone or nerve block. Typically these treatments have not found great success. Prolotherapy is an injection technique that stimulates ligament and cartilage repair. Prolotherapy will strengthen the weakened ligament junctions that can cause slipping rib syndrome – the sternocostal, the costochondral or the costovertebral junctions (the places the ribs meet to form the rib cage). It will also strengthen the costal cartilage. Doctors writing in the Journal of Back and musculoskeletal rehabilitation published research that showed positive results for Prolotherapy. The doctors examined twenty-one patients who underwent Prolotherapy (group 1) and thirteen underwent conservative therapy with analgesics (group 2). A visual analogue score (VAS) was recorded for measurement of pain intensity in all patients before and after injection first day, first week and fourth week. Group 2 received systemic nonsteroidal anti-inflammatory drug. VAS score was recorded similarly at the same times and clinical effects were compared between the two groups. The Prolotherapy group showed a faster recovery, including significantly reduced clinic findings. The patient is a 35 year-old female. She had been rushed to the hospital for the fourth time in less than a year complaining of severe chest pain. Obvious concerns were with a cardiac event. After EKGs, blood tests, x-rays, and a stay in the intensive care unit, the cause of her pain was still unknown. Everyone began to wonder if she suffered from problems of mental illness and catastrophizing thoughts. Upon her visit to us here at Caring Medical, she explained that she was not currently having severe chest pain but did feel a dull ache in her chest. She needed one more diagnostic test, physical examination with palpitation of the chest area to determine if the pain was being caused by problems related to Slipping Rib Syndrome. In this patient’s case, the diagnosis was made very quickly. Pressure to the left fourth thoracic rib attachment onto the sternum and the patient’s severe crushing chest pain immediately returned. Had she ever been examined in this fashion? She said she had not. The patient’s pain was caused by slipping rib syndrome. An extremely important point illustrated by this case is that even if an x-ray, blood sample, or EKG do not reveal a cause, they do not eliminate the presence of a physical condition as the source of chest pain. It is much more likely that the chronic chest pain is due to weakened soft tissue, such as a ligament or tendon. If heart and lung tests prove normal, yet the patient claims to still be experiencing pain, the patient is often given a psychiatric diagnosis. Depression, anxiety, and other mental illness challenges are not the etiological bases for most chronic pain. They can be associated factors involved in the problem, but they are normally not the cause. Chronic pain should be assumed to be originating from a weakened soft tissue. In this case, a rib was slipping out of place because the ligaments that hold the ribs to the sternum, the sternocostal ligaments, were weak. Without muscles to hold the ribs in place, loose ligaments allow slipping of the rib which causes further stretching of the ligament, manifesting itself by producing severe pain. The loose ribs can also pinch intercostal nerves, sending excruciating pains around the chest into the back. Sternocostal and costochondral ligaments refer pain from the front of the chest to the mid back. Likewise, costovertebral ligament sprains refer pain from the back of the rib segment to the sternum where the rib attaches. 1 González Temprano N, Ayuso González L, Hernández Martín S, Molina Caballero AY, Pisón Chacón J, Martínez Bermejo MA. Slipping rib syndrome. An aggressive but effective treatment. An Sist Sanit Navar. 2015 May-Aug;38(2):329-32. 2 Şentürk E, Şahin E, Serter S. Prolotherapy: An effective therapy for Tietze syndrome. J Back Musculoskelet Rehabil. 2017 May 5.